Adam White’s installation work uses altered comic book story narrative, by way of dialogue bubbles, to represent the wave of information we constantly process from day to day. Thrown out of context by removing the comic imagery, the remaining dialogue can only hint at a larger story, unable to provide the full narrative. Adam White is an artist living and working in St. Paul, Minnesota. In 2007 he received a Master of Fine Art with a focus on Installation and Paper Sculpture from the University of Maryland, College Park, and in 2004 a Bachelor of Fine Art in Painting and Drawing from the University of Tennessee at Chattanooga. He has exhibited work in Minneapolis/St. Paul, Detroit, Philadelphia, Baltimore, Washington DC, and New York City. 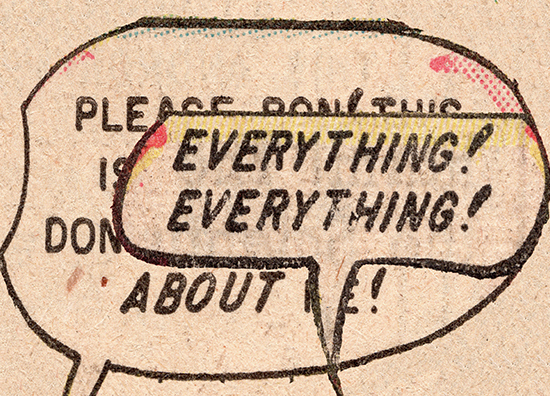 His current studio work uses altered comic book story narrative, by way of dialogue bubbles, to represent the wave of news or personal information we constantly process from day to day. Thrown out of context by removing the comic imagery, the remaining dialogue can only hint at a larger story, unable to provide the full narrative. The work, composed of thousands of overlaid paper word bubbles, varies between medium to large scale wall installations.